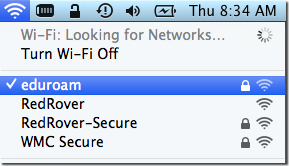 Select eduroam from the Airport menu bar item. Username: Your NetID@cornell.edu, for example pqs665@cornell.edu. When prompted to examine the server's certificate, click Continue. 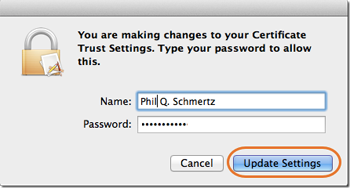 If prompted, enter your OS X admin username and password to apply the changes. Note: If you are unable to connect to secure Wi-Fi using eduroam, you can connect using the RedRover network. For more information see Connect to RedRover. Connect to the eduroam secure wireless network using an Android device. Connect to the eduroam secure wireless network with an iPhone, iPad, or iPod-Touch. Connect to the eduroam secure wireless network with Windows 10. Connect to the eduroam secure wireless network with Windows 7. Connect to the eduroam secure wireless network with Windows 8. 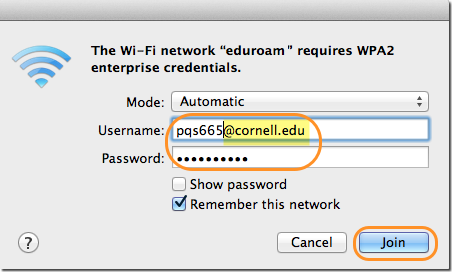 Troubleshoot your eduroam connection at Cornell or other campuses. 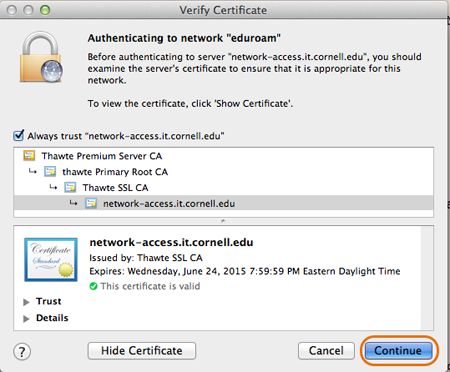 Trust the eduroam certificate the first time you connect using an iOS device.